The simplified silhouette of the Non Boat Shoe is offset by the audacious two-tone upper and the addition of a removable kiltie. 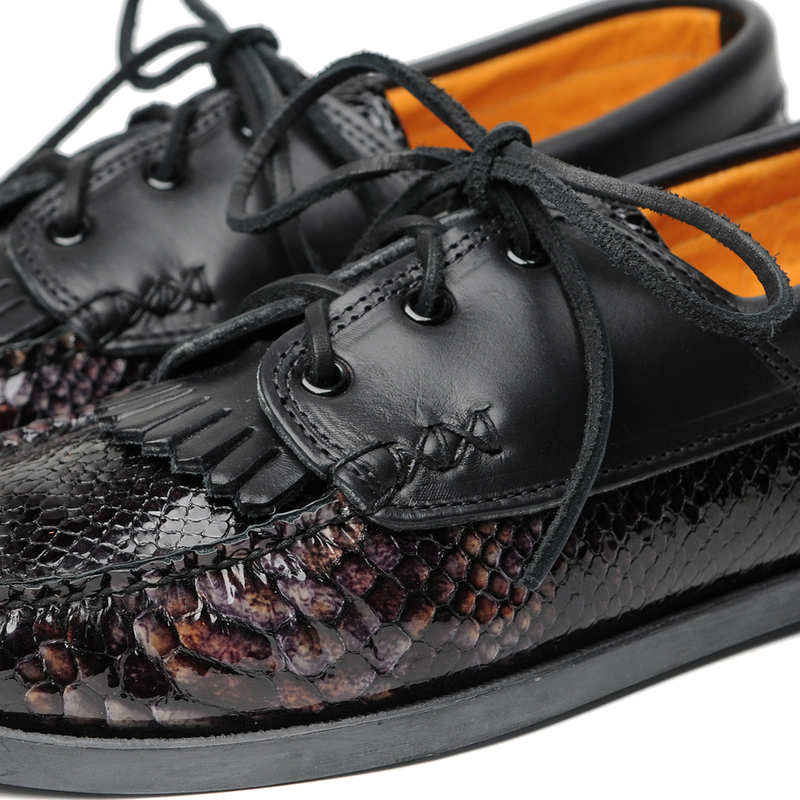 Rendered in imitation snake patent leather and Horween Latigo leather for Spring and Summer ’15, the Non Boat Shoe with Kiltie strikes a playful tone aesthetically while maintaining excellence in craftsmanship and materials. Each pair of Yuketen’s American-made genuine moccasin-construction footwear is hand-sewn by leather artisans in the northeastern United States who have mastered their craft through decades of experience. The shoe's upper is hand-punched and hand-sewn with awl, needle, and thread on Yuketen's proprietary last in order to ensure reinforcement and an integumentary fit. Full-leather insoles, leather tucks and steel shank reinforcements increase fitting in the arch and heel as well as lessen foot fatigue by forming a stable bridge between the heel and ball of the individual owner's foot. Our Yuketen tucks are also made from 100% vegetable-tanned leather and will naturally accommodate the distinct shape of the wearer. Yuketen’s signature Boat Sole is made from 100% rubber and is stitched directly to the vamp. Razor thin incisions in the outsole (known as 'siping') serve to provide traction by opening where pressure is applied but stay sealed against debris, therefore protecting delicate surfaces against unwanted abrasion. The Non Boat Shoe with Kiltie is an attractive remix on the classic boat shoe profile. It’s execution with premium components makes it a reliable and fun addition to any wardrobe for the summer season.